The Internet-as-Therapeutic-Outlet is not terrible in principle, because it’s healthy to express sincere emotions if you feel them welling up, and because others might glean something from your perspective—narrowness of experience here being a perk rather than a limitation. But too often, the emotions that hit Twitter upon news of a celebrity’s death, be that person beloved or despised, seem conjured up ad hoc by those who need to have some stance on the topic of the moment. Twitter vultures seize on this opportunity for performative mourning: a desperate hunt for silver linings, a way to score empathy points. Check it out, I too can feel for the plight of this poorly-understood Bad Man; he was a Bad Man, but he was decent to his children and pets; he was a Bad Man, but we should also feel very bad about how callously we discussed his Bad behavior. This is easiest to do if you view it through the prism of those least inclined to care (or to even be fully aware) that he was a Bad Man in the first place. But he was also just a 46-year-old man. A man with a wife who will be a widow, and children who will live the rest of their lives without a father. A man with a family who loved him, a man with a troubled past, who had more than his share of struggles with the basic business of living as a human being and as a man. These are unambiguous facts. But, um, are they the most salient facts to bring up about this man? Not to suggest that an obit should degenerate into a rap sheet (in this case, a pretty colorful one), but your banal attempts to humanize someone can go only so far. Humor is a tricky tool in death-time, best deployed (or not) on a case-by-case basis. I can offer no rule of thumb, except that basic decency sets some small limits on how to respond—maybe don’t go out of your way to exacerbate the pain of their blameless loved ones, maybe don’t picket their funeral like the Westboro Baptist Church, etc. But if someone committed evil acts, those cannot be blotted out of the narrative, or disingenuously offset with compliments for the sake of false balance. Even when the world loses someone that seemingly everyone exalts as truly great, an empowering alien-saint—like David Bowie—we deserve some nuance. 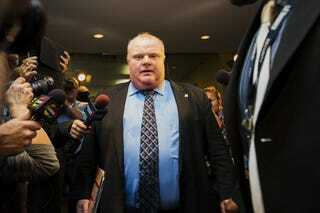 So does Rob Ford, for the opposite reason. But not too much.